As South African’s look with anticipation towards a brighter medium term economic performance, eager on GDP growth and the ability of politics to steer the country, well-earned scepticism continues to linger. A steady stream of results will earn back the confidence of citizens and investors, which will directly impact on growth. We see a glimpse of this with the December 2017 consumer confidence index, which showed a slight improvement lead primarily by the improved GDP growth and agricultural conditions. With the changes within the governing political party, occurring early in 2018, it is probable that a further improvement in consumer confidence will be measured in the first quarter. However, much still hangs on the balance of government being able to show progress and accountability as the repercussions on bad politics still threatens a wearingly resilient economy. Consumer spending is a measured as the aggregate level of private voluntary consumption in an economy. Although it reached its highest recorded levels since 1960 in the last quarter of 2017, consumer spending has slowed down in January 2018, while personal debt has increased. Jason Muscat, senior economic analyst at FNB, said that, the “bleak outlook” for government finances remained one of the greatest risks to consumer spending in 2018. With Shoppers exercising caution, can we expect to see the usual flurry of activity in retail stores that typically precedes national holidays? Traditional Easter displays in previous years would flaunt vibrant colour, strong branding and enticing incentives to purchase, all supported by heavy stock buy-ins for the increased demand. Seasonal Easter promotional products drive up consumer purchases and create incremental sales for retailers. This year, Easter Sunday will be on the 1st of April. This is also the effective implementation date for the 1% increase on vat, amongst other increases like the fuel levy. Analysists confirm that the vat increase will cause financial pain for all households in South Africa, despite it being structured to lower the impact for low income earners. The tangible impact higher income households will be felt at the end of the month, when the major arear bills, like loan repayments and municipal bills are sent out. Therefore, we can expect to see a drag in April to tighter consumer spending from May onwards, which holds good growth expectations for Easter buying trends. Traditionally Easter is an eating holiday, with people spending most of their budget on chocolates/sweets and food. Since we have a braai culture, meat and braai compliments will find its way into trolleys. Consumers also purchase clothes, flowers and greeting cards. Due to the long weekend, DIY and gardening/home improvement categories see an upswing as people use the time to do maintenance and start new projects around the house. 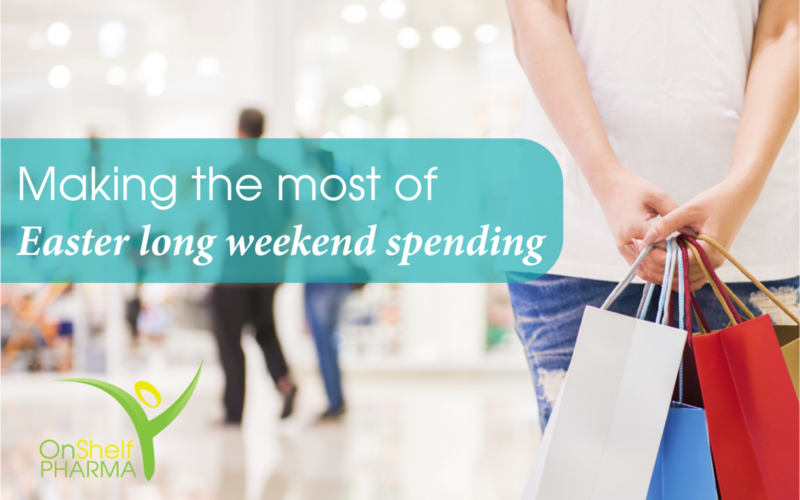 According to research, consumer activity generally increases prior to the Easter weekend and continues into the week thereafter. However with the vat increase kicking in consumers will most likely shift their buying, resulting in weighty sales the week before and tapering off in the week after. Easter is the 2nd highest holiday spend in the South African retail calendar. 5 ways to maximise on the consumer spending splurge this Easter. Promotions: Good value stimulates the strongest push of feet into store. Cost sensitive consumers will be on the lookout for ways to maintain their lifestyles ahead of cutting down, making them very responsive to special offers. Yes, a good price will bring consumers in but while they are there, build on their basket by creating appealing offers across categories. Easter being an eating holiday, create displays around family eating occasions. E.g.) an egg hunt is part of the tradition amongst children, so why not run a lunch picnic special by discounting the food and cross merchandising plastic plates, cups, umbrella’s, blankets…etc. This builds the shopping basket and blends the profit across commodities and high margin items. The same applies to brand owners partnering up with each other to offer combined value and build on their target markets. Advertise: Attract a wider market of customers by advertising. 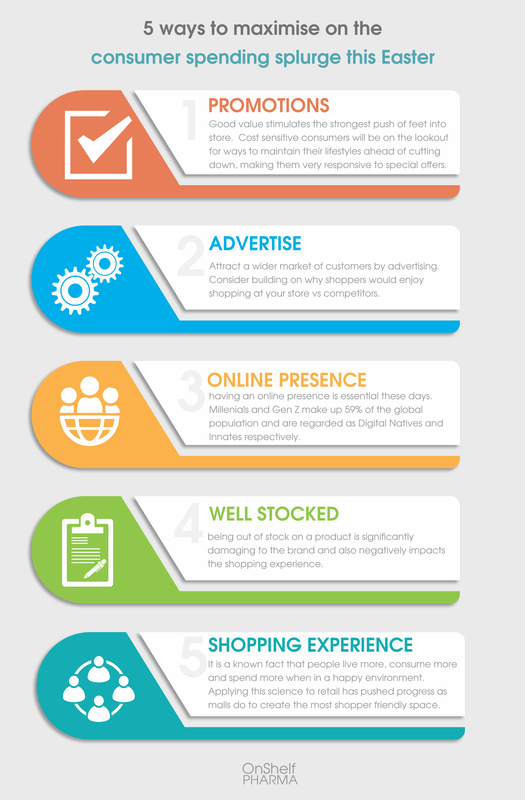 Consider building on why shoppers would enjoy shopping at your store vs competitors. The purpose of this is to communicate the entire experience e.g.) shaded parking, children’s activity area, faster payment process, free taster samples… Give your shoppers a reason beyond price to come to your store. Be sufficiently stocked: being out of stock on a product is significantly damaging to the brand and also negatively impacts the shopping experience. With certain categories, like baby diapers, mothers would rather leave the store in search of the item that she is looking for. This only needs to happen 2 more times before she permanently decides to shop somewhere else. Being sufficiently stocked is key to building store reputation as shoppers feel that their needs are met. Rather confidently estimate your Easter sales uptake especially in the week before. Create a pleasurable shopping experience: It is a known fact that people live more, consume more and spend more when in a happy environment. Applying this science to retail has pushed progress as malls compete to create the most shopper friendly space. Execution within a store involves building the entire experience so that it eliminates areas of shopping stress e.g.) shaded parking, children’s activity area, faster payment process, free taster samples, product advisors…etc. To recap on the most important thought threads, strategize to maximise your share of the Easter sales uptake and create competitive advantage. Creating value beyond price and building a differentiated reputation will yield good results into the future. Understand your customers’ needs and wants and work towards delivering on them. Personalisation still goes a long way and one should not under-estimate the value of community as a human need. Referrals and recommendations carry a high weight of influence as it is believed to be more objective and truthful than big splashy advertising. Advertising is necessary to create awareness but word of mouth converts to a sale with higher immediacy. So, this Easter, don’t put all your eggs in 1 basket when strategizing, think through all demand creation options at your disposal.